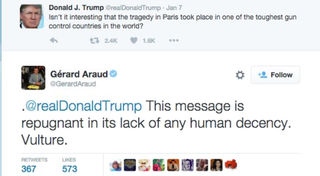 That reply to Donald Trump is from Gérard Araud, who is the French Ambassador to the United States, based in Washington DC. EDIT: My mistake, I did a google search now but I should have done it before posting. The tweet is from the Charlie Hebdo attack. Still repugnant, but it’s not related to yesterday’s attack. Though I’d point out that apparently Trump hasn’t deleted the tweet yet even though it’s getting a lot of attention now so presumably he still feels that way.